In a previous run in with Nazgrab and his boys most of the freebooters made it out, but one boy fell behind, Da Kaptin’s second in command, Grob. The poor bugger was not in a good way either, with a two crippled legs, a head wound and an old battle wound. 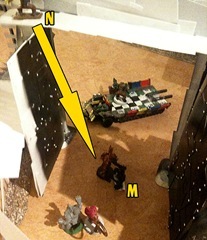 Things could hardly get much worse for him, but Da Kaptin was not willing to deal with new recruits, so a full-on raid was staged. Whilst the game lasted only five turns, plenty of blood was shed, even though only Nazgrab and Morduff were on the table, reinforcements not managing to make it in time for the brawl. 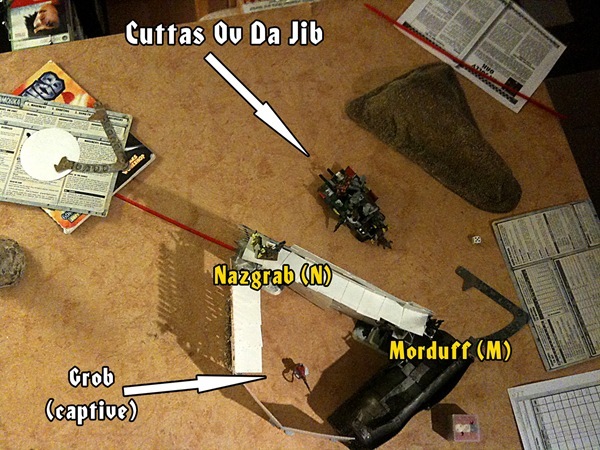 Nazgrab took up position in full cover (-2 to hit) on the gate’s ramparts with Morduff eyeing the intruders through his single remaining eye (probably not helped by his huge iron mask, a result of a recent visit to da dok). The lack of ballistic skill of little concern to him, holding his two favourite choppas. Their composure was short-lived, however, as Wabdash took the gate off its hinges, creating some rough terrain for vehicles but practically laying out a red carpet for warriors on foot. 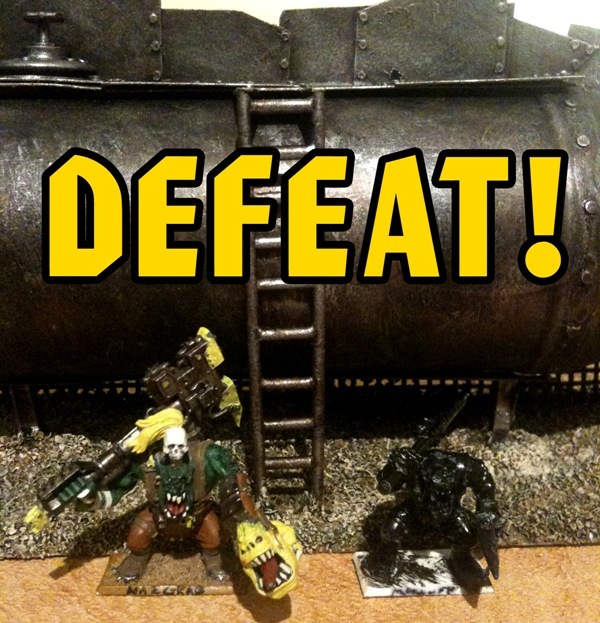 Freebootaz certainly know their way around kannons! 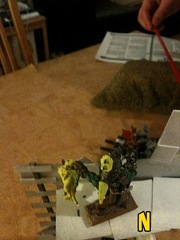 Nazgrab took aim at the trukk, doing his best to do some damage to it. 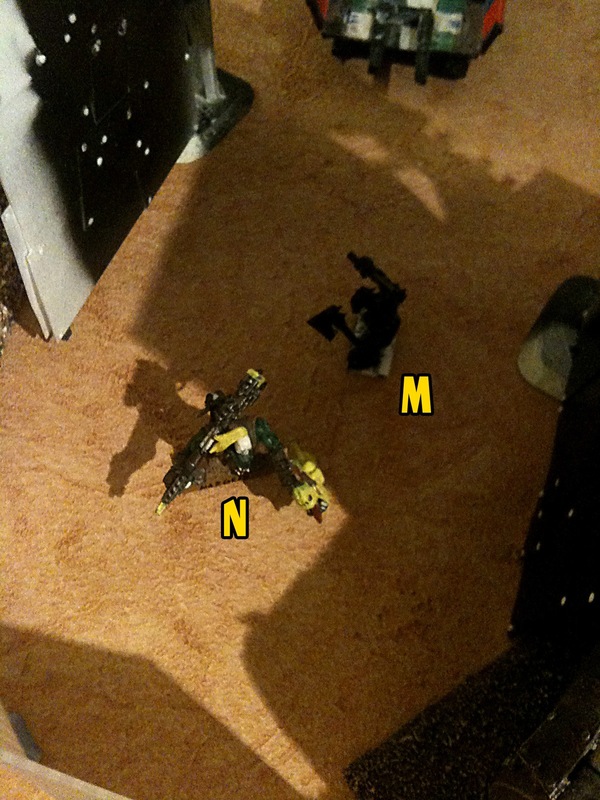 Unfortunately, whilst he hit it (not hard with a BS of 5..), his shoota was just too damn weedy to do any harm. Knowing full well that Nazgrab couldn’t do much against them, the freebootaz advanced, moving their trukk around and disembarking, eager to reclaim their lost crewmate. It was at this juncture that they got within Morduff’s reach and the vicious git dived in, tackling Da Banga’ and making enough of a mess of him that he was out straight away. 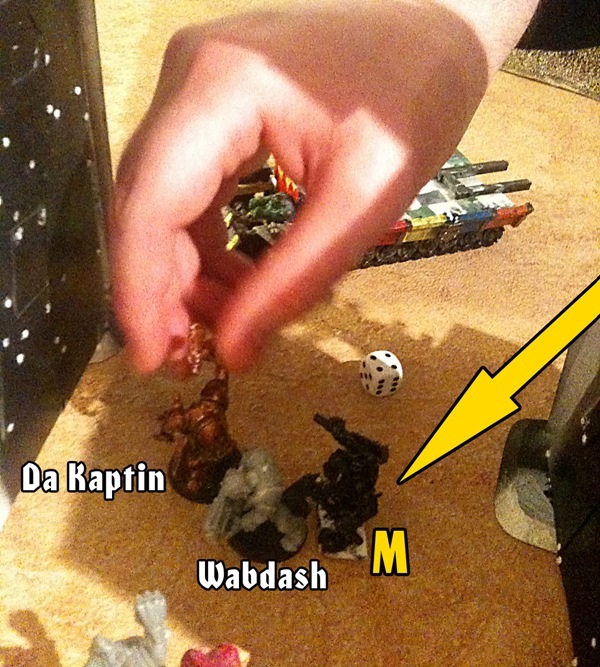 Having made short work of one freeboota, Morduff advanced on Wabdash, the plucky kannoneer. He didn’t fare much better, quickly going down to the relentless pummelling heading his way. Da Kaptin on the other hand was having none of this and skilfully matched the defender blow for blow, leaving combat at a stalemate. Seeing the vicious hand to hand going on below him, a thought occurred to Nazgrab – there was a fight in his fort but he wasn’t involved in it! Not to be bested by a mere boy, Nazgrab dived from his vantage point into the frenzy, taking down Da Kaptin in a flurry of precise blows from his trusty choppa. It’s not just for decoration! 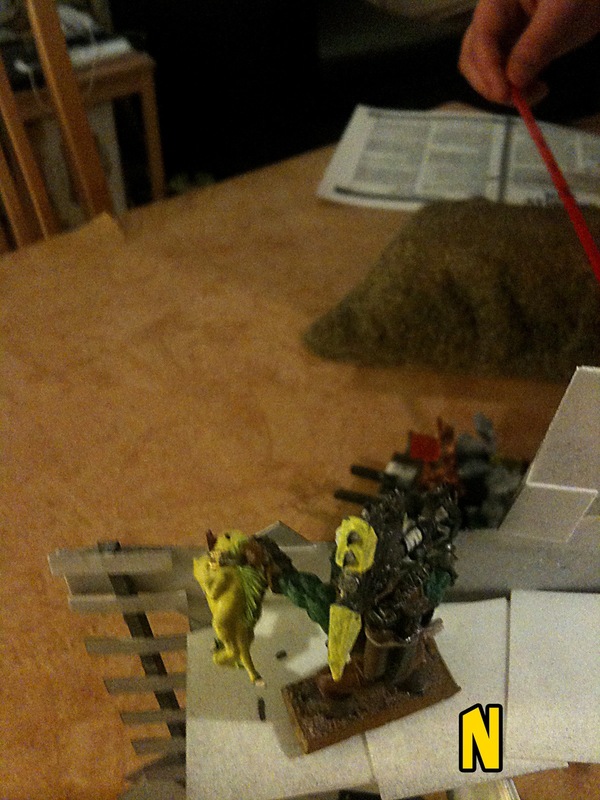 Not content with that and seeing that the captive had been freed by Gutsmek, the nob took the burly bad mek out. Permanently as it would later become clear. Then there was the escaping captive, presently armed solely with a knife. Short work was made of him. With no foot warriors left on the battlefield, it was remarkable that the freebootaz nerve held, but grabbing their wounded they chose to scarper off the edge of the board, technically winning by the conditions we decided upon (they freed the captive, after all!). Being the underdogs by 110 rating points, the win secured them a hefty 20 teef of extra income and a rather pleasant +9 experience point bonus for each surviving member. Unfortunately, whilst they’d got their crewmate back, it had cost them their bad mek, a rather vital mobster. To the job pole, lads! 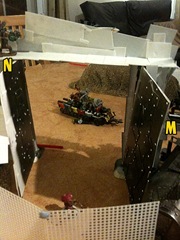 This entry was posted on Friday, January 8th, 2010 at 23:18	and is filed under Battle Reports. You can follow any responses to this entry through the RSS 2.0 feed. You can leave a response, or trackback from your own site.